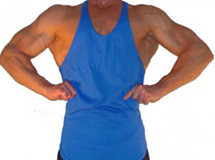 There are three common designs of tank tops for men which vary in back and shoulder strap width. This information page will differentiate and explain the various cuts. 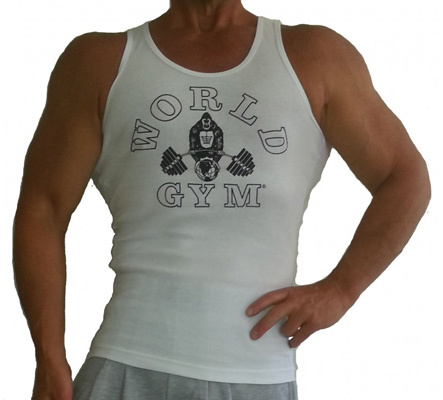 The range of motion tank top shirts provide make them the item of workout clothing athletes in the bodybuilding and weightlifting sports most appreciate. There are also differing fabric content, textures and colors to help diversify a bodybuilder exercise gear wardrobe. The most difficult style for men to find is the y-back string tank top because it’s a somewhat custom design. One of the most frequent comments we hear from our customers around the world is how they’ve been unable to find mens string tops and how thrilled they are to find them through our fitness store online. 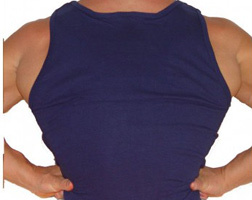 Often called a mens y back tank top because of the back strap configuration which forks at a lower point. The stringer tank top shoulder straps are the narrowest of all styles. This requires intricate stitching to keep them from rolling up like spaghetti and the additional labor makes them slightly more costly to manufacture. The large arm openings and unencumbered upper body area facilitates the strenuous movements of an intense bodybuilding workout. Additionally, the more exposed areas of a string tank allow for more efficient cooling. The racer back tank top for men is similar in design to the stringer tanktop. Both have wide open areas in the back and upper body. This style of workout tank top also allows for the same unrestricted movement and cooling. The difference is in the split configuration, the racerback tank top is often called a t-back tank top because the back fabric reaches the top of the neckline before branching-out. The straps are slightly wider than a string tank but a t back will still show those razor muscle cuts on the physique. The Racerback tank top is also not generally available through mass merchandise outlets but a complete selection can be found among the gym clothes available in our bodybuilding store. Although sometimes referred to as a tight tank top the actual fit is just the opposite. Stretch tank tops are the most comfortable and flexible of all. Best Form uses a special super-sheer fabric for the least restrictive fit for the wildly popular F399 which is featured in our Muscle and Fitness magazine advertisement. It’s like second skin and looks phenomenal on a buffed physique. The light, flexible material is the key because using too heavy of a material would create a compression tank top fit. The stretch tight tank top is cut in the y-back stringer design. The wife beater tank top style features a ribbed texture fabric. It’s also form fitting like the stretch stringer. The wider back and straps of the rib tank top are similar to the athletic cut. This is a sharp looking muscle wear item which looks good out of the gym as well.